The Rochester Red Wings are set to host the first-ever American Cancer Society Relay for Life event in the City of Rochester on June 29, 2013 at Frontier Field. The overnight, community walk around the warning track at Frontier Field will begin with a Survivor Lap at 7:00 p.m. on June 29 and conclude the following morning, June 30, with a Fight Back Ceremony at 7:00 a.m. In between, participants will take turns walking, running or otherwise circling the track "relay" style to raise funds to fight cancer. In addition, the celebration will include music, dancing, games, food and a candlelight vigil at nightfall to honor cancer survivors and caregivers and to remember those lost to cancer. "The American Cancer Society's Relay for Life is a truly amazing event and we could not be more proud as an organization to host a Relay event at Frontier Field this season," said Red Wings General Manager Dan Mason. "Everyone in some way, shape or form as been affected by cancer and this event is a great way to honor the victims and survivors as well as fight back against this terrible disease." Relay participants can sign up individually or as a member of a team at www.relayforlife.org/redwingsny and are encouraged to raise money prior to the event. 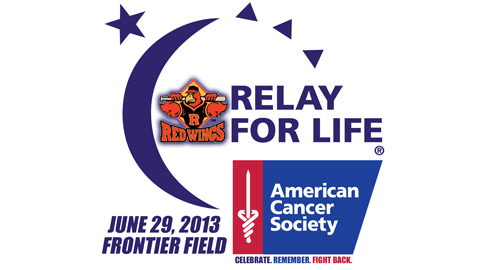 Participants who raise over $100 will receive an official Rochester Red Wings Relay for Life T-shirt. Participants interested in learning more about the Red Wings Relay for Life event are invited to attend the kickoff party at Frontier Field from 12:00 p.m. to 4:00 p.m. on Saturday, March 23 - the same day single-game tickets go on sale for the upcoming 2013 baseball season. The ACS's Relay for Life event ignites team spirit among participants and works to raise funds used to save lives and create more birthdays by helping you stay well, helping you get well, by finding cures, and by fighting back.